FILE - A B-1B Lancer arrives at Andersen Air Force Base, Guam, July 26, 2017, in this photo provided by the U.S.Air Force. U.S. President Donald Trump and Chinese President Xi Jinping reiterated their mutual commitment to denuclearize the Korean peninsula during a telephone conversation Friday, the White House said in a statement. The statement said the leaders affirmed that the recent adoption of a new United Nations Security Council resolution regarding North Korea was an important and necessary step toward achieving peace and stability on the Korean peninsula. It also said the presidents agreed North Korea must stop its provocative and escalatory behavior. Earlier Friday Trump issued a new warning to North Korea, saying the U.S. military was “locked and loaded,” as Pyongyang leveled accusations that the U.S. leader was driving the Korean peninsula to the brink of nuclear war. 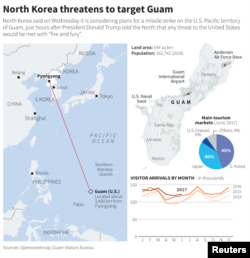 Trump also repeated his earlier warnings to North Korea against threats or actions toward the island of Guam, saying “if anything happens to Guam, there’s going to be big, big trouble in North Korea.” Pyongyang has threatened to send missiles toward the U.S. Pacific territory, home to a major U.S. military hub. Earlier Friday, Trump said North Korea’s leader will “regret it fast” if he threatens or acts against Guam, or any other U.S. territory or ally. He said he hoped North Korea fully understood his words of warning over the past few days if it initiates war against the U.S.
“I hope that they are going to fully understand the gravity of what I said, and what I said is what I mean,” Trump said. The president’s warnings Friday came hours after China said would not assist North Korea if it launches a first strike that threatens U.S. soil and the U.S. retaliates. The warning from China was published in an editorial Friday in the Global Times, a state-owned newspaper that recommended Beijing remain neutral in the event of a North Korean first strike. "China should ... make clear that if North Korea launches missiles that threaten U.S. soil first and the U.S. retaliates, China will stay neutral," said the newspaper, which is not an official voice of China's Communist Party. The editorial said, however, that China would intervene if the U.S. and ally South Korea collaborated militarily with the intent of ousting Kim Jong Un's regime. "If the U.S. and South Korea carry out strikes and try to overthrow the North Korean regime and change the political pattern of the Korean Peninsula, China will prevent them from doing so," it said. The editorial amounted to a reiteration of China's position on the escalating tensions on the Korean Peninsula, as it has repeatedly warned the U.S. and Pyongyang to refrain from taking provocative actions. On Thursday, Trump stiffened his resolve against North Korea, saying if Pyongyang struck first, "things will happen to them like they never thought possible." Trump said that his earlier warning to inflict "fire and fury" on the reclusive communist regime for its nuclear weapons development program perhaps "wasn't tough enough." Asked what would be tougher, Trump told reporters at his golf resort in Bedminster, New Jersey, "You'll see. ... North Korea better get their act together, or they're going to be in trouble like few nations ever have been in trouble in this world." 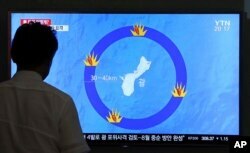 A man watches a TV screen showing a local news program reporting on North Korea's threats to strike Guam with ballistic missiles, at the Seoul Train Station in Seoul, South Korea, Aug. 10, 2017. Trump's remarks came hours after North Korea said it was finalizing a plan to launch four ballistic missiles to the waters off the shores of the U.S. territory of Guam, Pyongyang's latest provocation in the war of words between it and Washington. Later Thursday at an event in California, Defense Secretary Jim Mattis said the United States was focused on diplomacy, but it was his responsibility to have military options ready "should they be needed" in the event of a war with North Korea — an option he said "would be catastrophic." Mattis stressed, however, that diplomatic efforts were gaining traction. "I want to stay right there, right now," he added. In an unusually detailed announcement, North Korea's military said Thursday that within a week it would hand Kim a plan to fire the four Hwasong-12 missiles over Japan toward Guam, 3,300 kilometers to the south. North Korea's state media said the missiles would be fired "to signal a crucial warning to the United States." On Friday, South Korea's presidential office said that South Korea's chief of national security, Chung Eui-Yong, and U.S. counterpart H.R. McMaster had reaffirmed their close cooperation on North Korean issues. Chung and McMaster had a telephone conversation to discuss North Korea, presidential spokesman Park Su-hyun said. Concern is mounting in the Pacific region and around the world about the increasingly heated rhetoric between Washington and Pyongyang. The Association of the South East Asian Nations issued a statement this week "expressing grave concern over the escalation of tensions in the Korean Peninsula." ASEAN ministers urged North Korea to "immediately comply fully" with all U.N. Security Council resolutions, which include the most stringent sanctions yet that were imposed last week. Japan began deploying surface-to-air missiles after North Korea threatened the missile launches over western Japan and toward Guam, Japan's Defense Ministry said Friday. German Chancellor Angela Merkel said Friday that she didn't see a military solution to the rising tensions between the U.S. and North Korea, and she called on both countries to de-escalate their comments. "I think escalating the rhetoric is the wrong answer," she said. Russian Foreign Minister Sergei Lavrov said the risk of a military clash between Washington and Pyongyang was "very high," and he added that language fueling the tensions was "over the top." Despite the bravado, the Trump administration has been quietly engaging in back-channel diplomacy with North Korea for several months, according to The Associated Press. Discussions reportedly have focused on Americans who are jailed in the communist country and souring relations between the longtime adversaries. When asked by a reporter Friday about reports of back-channel diplomacy, U.S. Deputy Assistant Secretary of State Patrick Murphy said he didn't "have anything to comment" but added, "Now is not the opportunity for dialogue because we have not seen North Korea's willingness to address ... fundamental problems" that include the development of missile and nuclear programs "in defiance of the international community."